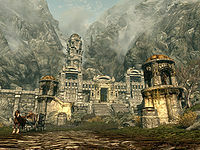 The Reach is a hold in western Skyrim, with Markarth as its capital. It is initially affiliated with the Imperial Legion, but can be captured by the Stormcloaks after completing Compelling Tribute and The Battle for Fort Sungard. It can also change sides as part of negotiations during Season Unending. The terrain is very mountainous, containing the Druadach Mountains. The far eastern edge of the hold from Broken Tower Redoubt in the north to Fort Sungard in the south is more hilly. The mighty Karth River and several smaller tributaries originate here. The Reach is home to the native Forsworn, who will attack any outsiders on sight. The most characteristic flora are the juniper berry bushes which are native to the Reach. Hanging moss, more common to caves, also seems to thrive there. Mora tapinella and sparse populations of mountain flowers are to be found throughout the hold but in the northeast the flowers can be quite common. All locations in the Reach with individual map markers are listed. There are a few places without map markers listed for their significance. †Only technically located in the Reach. There are three Dragon Mounds in the Reach. West of Bruca's Leap Redoubt. West of The Lover Stone. There are three Shrines in the Reach. A Shrine of Dibella south of Old Hroldan Inn. A Shrine of Mara south of Soljund's Sinkhole. A Shrine of Zenithar west of Four Skull Lookout. Alduin's Wall: Locate the prophecy within Sky Haven Temple. The Taste of Death: Prepare a feast for the Lady of Decay. Locate the Assassin of Old: Find the Dark Brotherhood Assassin. Hard Answers: Help translate Gallus's journal. The Litany of Larceny: Find items for Delvin Mallory throughout the questline. No One Escapes Cidhna Mine: Escape from Cidhna Mine! The Heart of Dibella: Find a new Sybil for the Temple of Dibella. The Lost Expedition: Recover the journals from the expedition in Nchuand-Zel. Evil in Waiting: Seal away an ancient evil. Forbidden Legend: Investigate the forgotten Gauldur Legend. 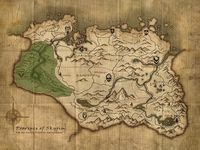 In addition, many miscellaneous quests are located in the Reach. They are listed here. This page was last modified on 15 March 2019, at 21:46.